What does the Steel Bridge Design Team do? Steel Bridge is an organization that allows students to get experience working on a practical engineering problem. 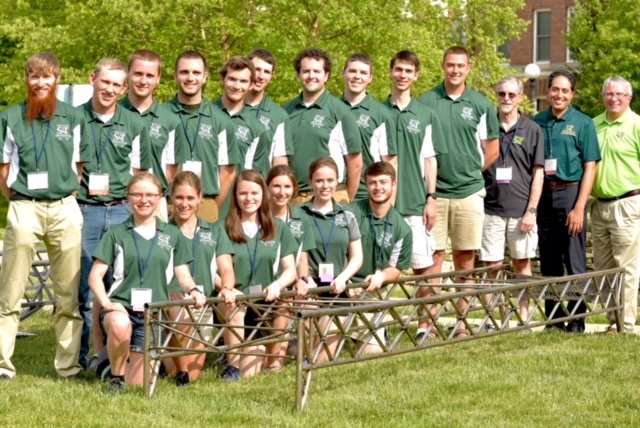 The team designs and fabricates an approximately tenth-scale bridge and competes with other schools across the world. In the fall semester, the team focuses primarily on the design of the bridge. Many bridge designs and ideas are tested using structural analysis software and ultimately the best bridge is selected. 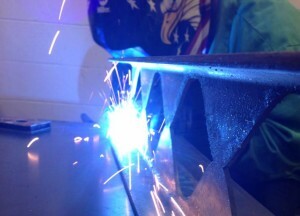 In the spring, the team fabricates the bridge from scratch in the SDELC. This is a great opportunity for students to gain experience with welding, grinding, cutting steel, drilling, etc. The bridge has to be made into separate pieces depending upon the specifications in the rules. Later in the spring, the team takes the bridge to a regional competition where different schools compete in categories including construction speed, construction economy, lightness, stiffness, structural efficiency, and aesthetics. If the team performs well, then they are allowed to attend the national competition at the end of the school year. The steel bridge team has no restrictions on what majors can join the team. 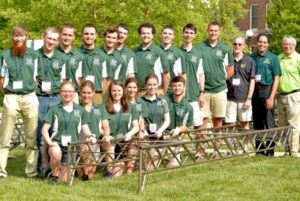 Many students on the team are from civil engineering, architectural engineering, mechanical engineering, metallurgical engineering, and several other departments. The interdisciplinary teamwork skills that are developed from steel bridge will be very beneficial for your future engineering career. So in fact, the team encourages all to join the team because it is a great experience for any engineering major. No prior knowledge of bridges or engineering is required to take part in the team and more experienced members are more than happy to help new members. The design and fabrication of a steel bridge is a problem that requires the expertise of various different engineering disciplines. Because of this, the team draws in students from several different departments and allows students to gain interdisciplinary experience that employers are looking for. Furthermore, there are plenty of leadership opportunities within the organization that can help your resume stick out. Many students on campus describe the steel bridge team as a family. Social events are hosted by the team on numerous occasions throughout the semester which are fun and foster the development of long lasting friendships. There are quite a few upperclassmen within the organization that are more than happy to offer advice to younger students. Finally, the team fully understands that as college students, we all have a lot on our plates. It is encouraged to put as much time into the organization as you can. If you want to get more out of the organization then there are tons of opportunities to get involved in the shop or help out with design. Come to one of our general meetings to get more information about our organization. You can also contact any officers for more information. More information can also be found here.